Want to go for Umrah but running tight on budget? Worry not! We have the right Umrah package for you. I'timaar offers specially customized economy Umrah packages with high- quality services and visa assistance. Whether you are planning to go solo or travelling with family or group to perform Umrah, we have got you covered. Stay in control of your budget throughout the journey with our all-inclusive 3-Star Umrah packages which not only include your flights, accommodation and transportation but also Ziyarat of the important holy sites in Makkah and Madinah. 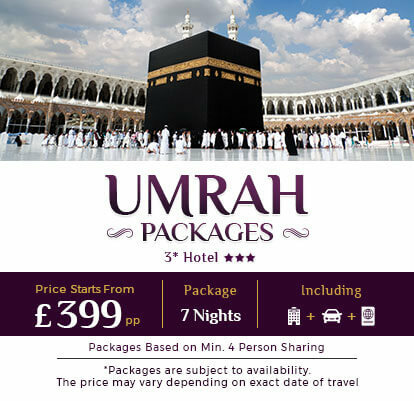 I'timaar offers a wide range of 3-Star Umrah Packages 2019 from UK specifically designed to suit your schedule and budget. Our team of Hajj and Umrah experts is committed to providing you with the required assistance and guidance throughout your journey so that you fulfil all the rites and duties of Umrah with complete peace of mind. I’timaar offers the cheapest Umrah packages with flights, best 3-Star Hotel accommodation near Haram and Masjid e Nabawi, and ziyarat of the holy places in Makkah and Madinah. With our best economy Umrah deals, Muslim brothers and sisters from London, Manchester, Birmingham or other places in UK can avail this opportunity to perform Umrah at the lowest price and within their budget. Those who are looking to perform Umrah for the first time will be assisted and guided throughout the pilgrimage. Pilgrims will be given tips and tricks about how to perform Umrah. Our Hajj and Umrah experts are always available throughout your journey and will also offer advice on the best time to perform Umrah or multiple Umrahs during your limited stay in Makkah. The weather conditions are quite harsh in Saudi Arabia throughout the year but November to January is the time when the weather gets milder, which is why it is the most popular time for Umrah apart from Ramadan. I’timaar is an experienced travel agency associated with numerous 3-Star hotels in Saudi Arabia to provide you a wholesome Umrah experience. Our Umrah experts provide booking assistance and services for UK citizens in their desired 3-Star accommodation in Mecca and Medina, Saudi Arabia. You have the choice to select from our wide range of associated 3-Star hotels. You may wish to book our hotel-only packages if you have arranged everything else on your own. However, you are recommended to book our all-inclusive deals which consists of accommodation, transfers, ziyarat and flights to avoid any hassles during your Umrah. Our low-cost Umrah packages include 3-Star hotel accommodations in the holy cities of Mecca and Medina. If you are travelling with elderly, disabled or kids, do not worry, as we have special provisions for them. We take care of old-aged citizens, disabled persons and kids during their Umrah tour while ensuring that they have a comfortable stay in Saudi Arabia. They are catered in a special manner with delivery of specific arrangements such as cot, wheelchair, meals, ground-floor accommodation and so on. Our travel experts will find the cheapest flight tickets and most affordably priced 3-Star hotels suitable to your requirements. Talk to our experts to avail the best package that fulfils your need and demand. You will be staying in 3-Star hotel accommodation nearest to Masjid e Nabawi and Masjid Al Haram that adds to your Umrah experience as you can easily walk to the mosques for prayers anytime you want. The hotels are clean with plush rooms and embedded with all the modern amenities. Your convenience is a guaranteed factor in our 3-Star Umrah deals. We arrange direct flights to Saudi Arabia at the lowest rates, allowing you to depart from cities such as Birmingham, Manchester, London and Bradford. To avail our lowest prices and bargain deals, you are recommended to confirm your booking of 3-Star Umrah deals at least 6 weeks in advance. You have the option to choose desired International airline carrier tickets and the departure dates. Book your flight ticket to Saudi Arabia without splurging too much money and get ready to experience a convenient journey to the sacred land. I’timaar also offers flight tickets for Umrah and it’s entirely your choice whether you want to opt for the complete 3-Star Umrah package or book the flights to Jeddah or Medina for your pilgrimage. Every year, we help hundreds of Umrah pilgrims to travel to Saudi Arabia from Heathrow, London. All the topmost international airlines have flights departing from Heathrow airport. Although Birmingham, Gatwick and Edinburgh are also the departure points for pilgrims, Heathrow airport is the most popular amongst UK citizens. Whether you are travelling with your family or loved ones, flight tickets will be arranged by our travel experts at the cheapest rates. Our aim is to deliver the best-priced ticket in the Umrah package for every Muslim who wishes to visit the Holy land to seek Allah’s (SWT) blessings and forgiveness. Achieve this spiritual milestone by availing our budget Umrah packages that include the best accommodation near Haram and Prophet’s mosque, airport transfers, meals, private transportation and ziyarat of important Islamic sites. Our 3-Star Umrah all-inclusive packages are best suited for Muslims from UK going in groups and looking for an Umrah package with comfort and affordability. Choose your desired airlines for travelling to Saudi Arabia. You have an option to book direct or connecting flights to Jeddah or Madinah. Check into neat and clean hotel rooms and enjoy meals at the in-house restaurants. Both European and middle-eastern cuisines are available. Along with your Umrah, pilgrims are also taken to important ziyarat places in Makkah and Madinah. We ensure that all your needs are fulfilled in the most fruitful manner and your pilgrimage remains convenient and peaceful. Keeping our Umrah packages at the lowest price, we provide you the best 3-Star Umrah deals while ensuring that your whole experience of performing Umrah remains memorable. Our esteemed clients get quality services without any hassles and discomfort. The hotels are not only near to Haram but also to market places for your ease and convenience. We also provide wheelchairs to elderly and ensure ground-floor accommodation for them. Our low-priced Umrah packages offer you a chance to visit the holy cities and perform Umrah at the lowest possible rates. Our affordable Umrah tour packages are best suited for you if you are planning to perform Umrah in a group or with your family. Call our Hajj & Umrah experts to avail our cheapest Umrah deals or send your queries through email at bismillah@itimaar.co.uk. I’timaar is authorized by the Ministry of Hajj and Umrah in Saudi Arabia to organize Umrah tours from the UK. We are ATOL protected organization with transparent procedures and simple booking process. All our dealings are IATA approved and we follow all the rules and regulations imposed by the Saudi Government for providing Hajj and Umrah services.